5 of television’s heavily watched celebs will fix their marriage problems on camera via Marriage Boot Camp. The show airs this Friday, May 30th at 9pm. Marriage Boot Camp is an intensive and quite intrusive process of counseling that also includes various exercises & challenges in order to save their failing marriages. Included on the show will be The Real Housewives of Orange County‘s Gretchen Rossi and her fiancé Slade Smiley. Engaged-to-be-married couple, Jenni “JWoww” Farley and Roger Matthews, who are expecting their first child together. The Bachelorette‘s Trista Sutter and Ryan Sutter, her husband of over 10 years whom she met on the ABC reality hit. Former Bad Girls Club member Tanisha Thomas & her hubby Clive Muir. And last but certainly not least, Braxton Family Values couple Traci Braxton and Kevin Surratt joined the show despite being married for 20 years. I’ve watched Marriage Boot Camp, Bridezilla’s edition & I have to say that most of those couples changed for the better after time with Larry & Elizabeth Carroll, the directors of Marriage Boot Camp. If you have ever watched Bridezillas, then you know all those couples need some serious help. Based on feedback, many couples have gained help from simply watching the show. The Carroll’s have been doing Marriage Boot Camp for years, not just for television, so they have some experience on the subject. If nothing else, you can view it as a cautionary tale. I have to say Marriage Boot Camp is one reality show that spends their time promoting healthy relationships with self, spouses & others, with only a small side of ratchet added for flavor. (smile). Will you tune in? I am! 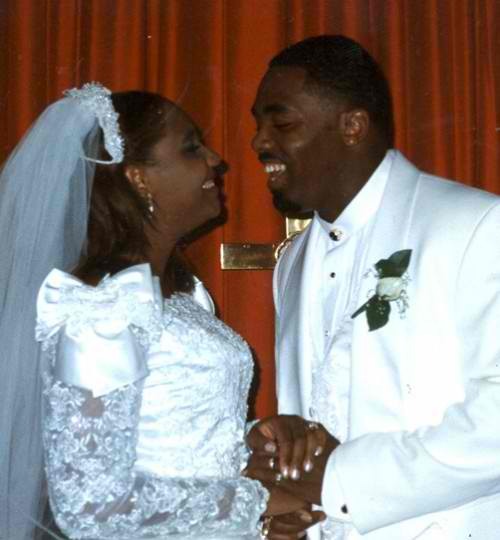 Traci Braxton & Kevin on their wedding day. This entry was posted on May 28, 2014 by Toiah in Everything you want.